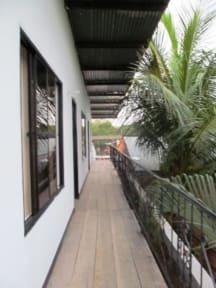 Hostel San Nicolas kohteessa La Macarena, Colombia: Varaa nyt! We are a family-run hotel located in the heart of the cozy town of La Macarena – the meeting point for adventurers who want to explore and enjoy the unique beauty of Cano Cristales and the Guayabero River. If you are looking for a place where you can find yourself happy in every morning, lay back and admire the surrounding of nature, you are invited to stay with us. All rooms are spacious and airy, have their own bathroom with a shower and toilet, and are equipped with a TV set. You can choose between standard private rooms or dormitories each of them with comfy wooden beds dressed in soft linens. After long trips to the various rivers and Sierra de da la Macarena you can kick back with a cold beer and curl up in our hamacas area. Our knowledgable staff can support you with the organization of all activities and tours around Cano Cristales, La Macarena and the Guayabero river if needed. Morevoer we offer free airport pickup so don’t hesitate to let us know the time you will be arriving.